Mary Cassatt, Little Girl in a Blue Armchair, 1878, oil on canvas, overall: 89.5 x 129.8 cm (35 1/4 x 51 1/8 in. ), National Gallery of Art, Collection of Mr. and Mrs. Paul Mellon, 1983.1.18. With Little Girl in a Blue Armchair, Mary Cassatt captures a brief moment of rest between moments of play. The diagonal defining the interior space and the cross-cropped sides underscore a private glimpse of the special relationship between a girl and her dog. These same features within the painting also reveal a different relationship -- one between the artist, Mary Cassatt, and her mentor and colleague, Edgar Degas. With technological assistance, art historians have only recently understood the significant contributions Degas made to this particular painting. These revelations have impacted the historical narrative of the painting while triggering more modern questions about copyright law. When would the law consider two artistic collaborators as joint authors for the purposes of copyright? Even though the painting is in the public domain, Little Girl in a Blue Armchair provides an interesting backdrop on which to examine joint authorship and whether Degas and Cassatt would be considered joint authors if the work was painted today. Joint authorship arises when two or more authors intend their contributions to be merged as inseparable or interdependent parts of a whole, requiring an investigation into the minds of the authors. With no surviving communications between Cassatt and Degas, the painting provides the strongest evidence of their personal and working relationship. Visual analysis of the painting, therefore, reveals insight into not only the historical and artistic association between the artists but also the challenges in applying copyright’s joint authorship standard to visual art. Mary Cassatt (1844-1926) was an American painter and printmaker that worked mostly in France. Edgar Degas (1834-1917) invited her to join a group of independent artists later known as the Impressionists. As the only American painter associated with the group, she exhibited works at the Fourth Impressionist exhibition in 1879 in addition to the exhibitions in 1880, 1881, and 1886. Cassatt excelled at depicting images from the private sphere of women and their young children. An 1878 oil on canvas, Little Girl in a Blue Armchair, portrays a young girl sprawled on a blue armchair that matches several other armchairs in the room. She stares at the floor seemingly unaware of the artist while her dog dozes in the chair nearby. The girl’s candid pose contrasts with the care of her dress: the tartan shawl, matching socks, bow in her hair, and her shiny shoes. The little girl was a child of Degas’s friends, and the Brussels Griffon sleeping with its eyes tight shut belonged to Cassatt. Behind the two figures, the light enters through the French doors in the background and “enlivens the texture and pattern of the inanimate objects in the room”. (National Gallery of Art). The texture and colors of the chairs’ upholstery reflect Cassatt’s interest in Japanese prints – an interest which she shared with Degas. "Dear Sir, I wanted to come back to your place yesterday to talk to you about the portrait of the little girl in the blue armchair. I did it in 78-79 - it was the portrait of a child of friends of M. Degas - I had done the child in the armchair, and he found it to be good and advised me on the background, he even worked on the background- I sent it to the American section of the Gr. Exposition 79 but it was refused. Since M. Degas had thought it good I was furious, especially because he had worked on it - at the time it seemed new, and the jury consisted of three people, of which one was a pharmacist." (Hoenigswald and Jones 2014, 114). Edgar Degas, Dance School, c. 1876, oil on canvas, 43.8 cm x 58.4 cm, Shelburne Museum, 27.3.1-35a. Unfortunately, Cassatt’s letter does not go into greater detail about Degas’s work on the background. Degas may have painted the light originating from the farthest window, which was a common feature in paintings by both Cassatt and Degas. (Getlein 1980, 16; Shackelford 1998, 115). 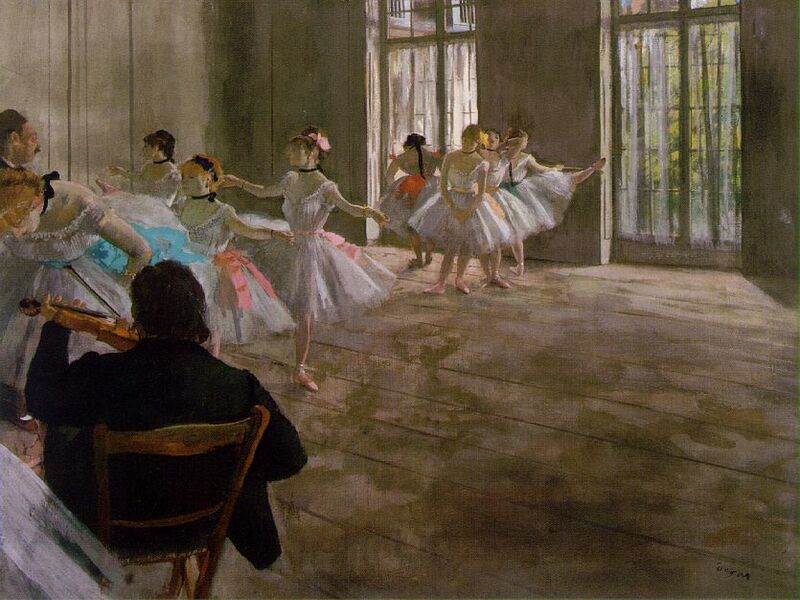 Similarly, arbitrarily cropped elements that form a “narrowly focused field of vision” are also common in Degas’s paintings such as his Dance School (1876, Shelburne Museum). (Shackelford 1998, 115). Looking at the painting more closely, there is a change in the brushwork where the back walls intersect beyond the furniture. These intentionally abraded strokes, a technique found on Degas’s works, thus likely came from a different hand. (Hoenigswald and Jones 2014, 117). But Degas probably borrowed Cassatt’s brush while she herself was working on the painting, as there is no significant change in the palette and the tones. Infrared imaging shows that Degas introduced the diagonal in the composition, replacing Cassatt’s parallel line between the floor and the wall. He thus directed the illusion of space by pushing the corner of the room to the far left. (Hoenigswald and Jones 2014, 117). Subsequent to Degas’s alterations, Cassatt then redrew the armless chair in the center of the picture to align it with the diagonal slope. Infrared imaging reveals that she manipulated this chair several times. (Hoenigswald and Jones 2014, 118). Even under plain eye, one can see evidence of the reworked passage as the texture and tone of the spot above the girl’s head does not match the rest of the chair. Like determining the attribution of a painting, copyright authorship of a work demands a nuanced analysis. The copyright in a work initially belongs to the author(s) who created the work. (17 U.S.C. § 201). While the Copyright Act does not explicitly define “joint authorship”, a joint work under the law is a work “prepared by two or more authors with the intention that their contributions be merged into inseparable or interdependent parts of a unitary whole”. (17 U.S.C. § 101). Contributions to a joint work are considered “inseparable” if the work contains a single form of authorship, such as a novel or a painting while contributions are considered “interdependent” if the work contains multiple forms of authorship, such as a motion picture or opera. (H.R. Rep. No. 94-1476, at 120 (1976); S. Rep. No. 94-473, at 103-04 (1975)). The legislative history of the 1976 Copyright Act further explains that a key requirement for a joint work “is the [authors’] intention, at the time the writing is done, that the parts be absorbed or combined into an integrated unit”. (H.R. Rep. No. 94-1476, at 120 (1976)). Authors of a joint work jointly own the copyright in each other’s contributions, and each author owns an undivided interest in the copyright. (17 U.S.C. § 201). Joint authors have an equal claim to profits and an equal right to exploit the work even if the author’s contributions were unequal. Joint authors may also use the work in any way they desire without permission from the other author. The only responsibility to the other author is to account for any profits. Under this statutory framework, every joint authorship analysis must consider: (1) each person’s creative contribution to the work and (2) the subjective intent to establish a person’s co-authorial status. (LaFrance 2001, 194). Legal scholars have disagreed about the required copyright status of each contribution of the joint work. Under the Nimmer test, a joint author’s contribution must be more than “de minimis”, but it does not need to be copyrightable while Goldstein, another legal scholar, has argued that each author must make a contribution that would be independently copyrightable. To ascertain the authors’ “intention”, courts must delve into each author’s mind and determine how they regard their legal relationship with the other author. (Brophy 1994, 498). But what manifestations of the author’s mind satisfy a showing of this intent? In Childress v. Taylor, the U.S. Court of Appeals for the Second Circuit held that both joint authors must have intended their contributions to be merged into inseparable parts of a unitary whole, considering themselves as joint authors in the process. (Childress, 945 F.2d at 507). The court suggested reviewing the contractual agreement, billing, or oral agreements between the authors as evidence of intent. (Childress, 945 F.2d at 508). In a later case, Thomson v. Larson, the Second Circuit further expanded upon this test, explaining that intent does not turn solely on words or professed state of mind but evidence of the authors’ demonstrated intent, such as the allocation of decision-making authority. (Thomson, 146 F.3d at 201, 203). The Seventh Circuit in Erickson v. Trinity Theatre further narrowed the showing of intent by stating that contemporaneous input or collaboration alone was insufficient for joint authorship. (Erickson, 13 F.3d at 1069). Despite the extensive case law, the scope and manifestation of intent required for joint authorship still remains unclear. Cassatt & Degas As Joint Authors? With the visual evidence of Little Girl in a Blue Armchair, would Degas and Cassatt qualify as joint authors of the painting for the purposes of copyright? With the painting in the public domain in the United States, this question is rhetorical, but the exercise allows for exploration of the artistic collaborations and the different “manifestations of intent” required for joint authorship. Degas’s Contribution: Are all brushstrokes equally creative? The first element of the joint authorship test is whether each joint author contributed copyrightable work. The prevailing test held by the courts is that all contributions to the work should be independently copyrightable. (See, e.g., Erickson, 13 F.3d at 1071). Regardless of the number of authors, copyright extends to original works of authorship that are fixed in a tangible form of expression. (17 U.S.C. § 102). An original work of authorship is a work that is independently created by the author and possesses at least some minimal degree of creativity. (Feist, 499 U.S. at 345). While the requisite level of creativity is extremely low, a work “does not possess the minimal creative spark” if the author’s expression is “obvious” or “practically inevitable”. (Feist, 499 U.S. at 363). While the copyrightability of Cassatt’s contributions are undeniable, were Degas’s contributions copyrightable? Do they contain enough creative spark for originality? One may argue that Degas’s brushstrokes, “subtle enough to be nearly undetectable”, were insufficiently creative for copyright. But the forced diagonal perspective added by Degas changed the illusion of space within the painting in a manner that was neither obvious, commonplace, nor inevitable, supporting a potential finding of creativity. The inseparability of these contributions inherent in this particular type of work exacerbate the difficulties of assessing the creativity of certain contributions over others. Without the aid of technology, it may be difficult to distinguish different hands among the brushstrokes, let alone which brushstrokes (contributions) are “creative.” Thus, the copyrightability status of Degas’s contributions remain unclear. Assuming Degas’s contributions were copyrightable, did both Cassatt and Degas intend to be “co-artists” of Little Girl in a Blue Armchair in the copyright sense? Following the Second and Seventh Circuit test, both authors must have intended to regard themselves as joint authors, meaning they intended to merge their contributions as inseparable parts of a unitary whole, creating a joint work. (Childress, 945 F.2d at 507). With no surviving letters between Degas and Cassatt, the only written evidence that may reveal such intent is the letter Cassatt wrote to the dealer. In this letter, she underlined “he even worked on the background” of the painting. While this may indicate Degas’s involvement in the painting, such evidence, even in the copyright context, reveals little about the minds of both artists. From this letter, one can assume that Cassatt thought highly of the work because of Degas’s involvement, but Degas’s intentions during the creative process remain unclear. The relationship between Cassatt and Degas perhaps addresses why Degas was involved in the painting at all. Degas served as Cassatt’s mentor inviting her to participate in the Impressionist exhibitions; and later as colleagues, they collaborated on certain endeavors. Cassatt, thus, likely welcomed Degas’s suggestions and perhaps encouraged him to add to the canvas directly. (Hoenigswald and Jones 2014, 115). The courts, however, have not considered friendly recommendations or even contemporaneous input as sufficient evidence of intent to create a joint work. (See, e.g., Erickson, 13 F.3d at 1069). With this particular evidence available, the painting itself may serve as the more constructive resource for understanding the minds of both artists. The subtly of Degas’s brushstrokes indicate that Degas intended his contributions to be inseparable from Cassatt’s work. Cassatt’s subsequent reworking of the girl’s armchair responding to Degas’s change of the horizon “was to achieve balance in the composition, but perhaps she, whether consciously or not, also wanted to acknowledge Degas’s role”. (Hoenigswald and Jones 2014, 118). Cassatt, thus, perhaps sought to acknowledge Degas as not only an advisor but as a partner in the creative process by recognizing these significant changes to the painting’s depiction of space. While courts also consider billing as a significant manifestation of intent, Cassatt’s sole signature on the painting may otherwise oppose a finding of intent for joint authorship. But even the courts have acknowledged that credit is not always indicative of intent. (Childress, 945 F.2d at 508). Degas, moreover, incorporated elements that were common in his own work, such as the forced diagonal perspective, the arbitrarily cropped elements, and the play of light through the curtained windows. All of these identifiable elements may have served as Degas’s “artistic“ signature. (Shackelford 1998, 115). An absence of a signature, even in the contemporary art context, does not indicate that a particular artist did not contribute to a work. A Resolution Between the Brushstrokes? Even if painted today, the joint authorship analysis of Little Girl in a Blue Armchair would still present a challenge. Any art historian would admit that figuring out an artist’s state of mind is still only a hypothesis; even an artist’s own words cannot necessarily be trusted. Similarly, while the courts have emphasized the significance of credit and billing when determining joint authorship, the absence of a signature on a painting should not necessarily disqualify authorship in either the artistic and legal contexts. The concept of joint authorship acknowledges that the creative process is not solitary but collaborative. The degree of collaboration needed to share the benefits and responsibilities of copyright ownership, however, is unclear, reflecting the variations among the creative processes behind each work. Therefore, without actions either seeking or denying joint authorship by either artist, the status of Little Girl in a Blue Armchair would still remain unclear even if painted today. The Lone Artist or an Artistic Team? Edgar Degas, Mary Cassatt at the Louvre: The Etruscan Gallery, c. 1879/1880, etching, aquatint, and electric crayon, plate: 26.8 x 23.4 cm (10 9/16 x 9 3/16 in.) sheet: 41.5 x 30.6 cm (16 5/16 x 12 1/16 in. ), National Gallery of Art, Rosenwald Collection, 1943.3.3366. Despite the academic nature of this exercise, the analysis reveals issues with the law, specifically the standard for intent. Even with available evidence originating either 100 days or 100 years ago, it is challenging to determine an artist’s state of mind. Emphasizing these nuances, the intent requirement goes beyond the language in the Copyright Act defining joint work, which merely requires an intent to merge contributions and not an intent to form a joint work as interpreted by the Childress court. (Yarbrough 2001, 509). Such a standard inherently presents challenges for visual works due to the nature of the creative process and artists themselves where an artist’s intent with the work is subjective, ambiguous, and perhaps even deceptive. From an artistic perspective, this exercise enhances our understanding of the creation of Little Girl in a Blue Armchair and the unique relationship between Degas and Cassatt beyond merely mentor and mentees but colleagues. Awareness of Degas’s collaborations does not require changing the attribution on the painting or the label on the gallery wall. But such insight does impact how one looks at the painting and appreciates the collaborative creative process. Taking a broader perspective, this painting and the relationship shared by Cassatt and Degas represent the interdependence and, perhaps in some cases, even the inseparability of artists working during the Impressionist period. Getlein, Frank. 1980. Mary Cassatt, Paintings and Prints. New York: Abbeville Press Publishers. Hoenigswald, Ann, and Kimberly A. Jones. 2014. "'All the Vocabularies of Painting': Adaptation and Experimentation, 1878-1879." In Degas/Cassatt, 114-125. Washington, D.C.: National Gallery of Art. National Gallery of Art. n.d. Little Girl in a Blue Armchair. Accessed December 20, 2018. https://www.nga.gov/collection/art-object-page.61368.html. Shackelford, George T.M. 1998. "Pas de deux: Mary Cassatt and Edgar Degas." In Mary Cassatt: Modern Woman, by Judith A. Barter, 109-143. New York: Harry N. Abrams, Inc.
Feist Publ’n, Inc. v. Rural Tel. Serv. Co., Inc., 499 U.S. 340 (1991). Thomson v. Larson, 147 F.3d 195 (2d Cir. 1998). Erickson v. Trinity Theatre, Inc., 13 F.3d 1061 (7th Cir. 1994). Childress v. Taylor, 945 F.2d 500 (2d Cir. 1991). Brophy, Scott C., Joint Authorship Under Copyright Law, 16 Hastings Comm./Ent. L.J. 451 (1994). LaFrance, Mary, Authorship, Dominance, and the Captive Collaborator: Preserving the Rights of Joint Authors, 50 Emory L.J. 193 (2001). Yarbrough, Jr., J. David, What’s Mine Might Be Yours: Why We Should Rethink the Default Rule for Copyright Co-ownership in Joint Works, 76 Tul. L. Rev. 493 (2001).